Eidsvaag Sirius – Fish Food Carrier. Back in 2011 a fishfood carrier put into pier 25. The Eidsvaag Vinland was operated for the Norwigian Fish farming company Skretting, between Newfoundland, St Andrews NB, and Nova Scotia. Though the ship was registered with the home port of Halifax, to my knowledge it never returned. Eidsvaag Vinland’s Canadian registration closed in march, and she is now trading under the Norwegian flag. Now her replacement has also arrived. 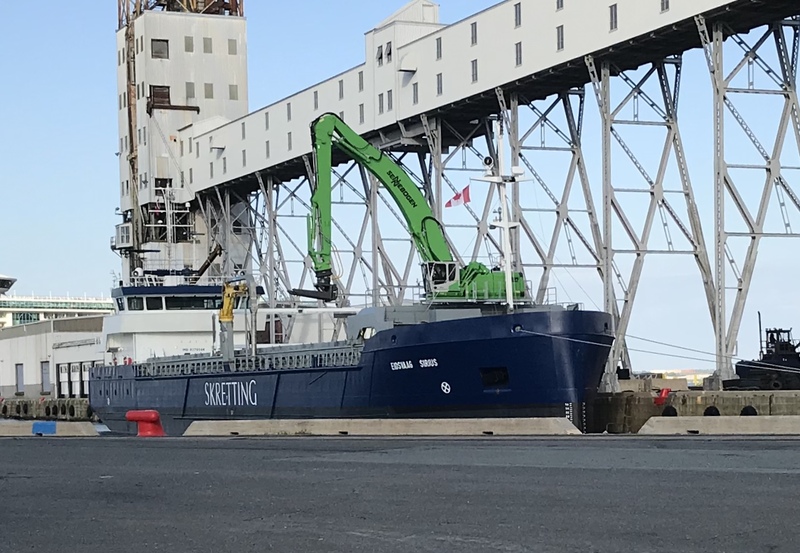 the Eidsvaag Sirius arrived on June 12, and will likely be Canadianized and re-flagged. This entry was posted in General Cargo on June 14, 2018 by Peter.